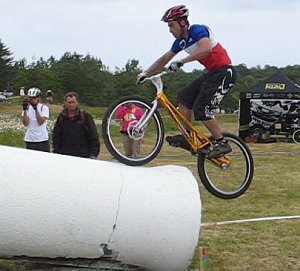 A pure biketrials technique that will take you up any gnarly rocks and odd shapes, without a lot of run up distance and virtually no effort, just cycling along. But it takes a good synchronisation of the pedaling and the weight transfer on the front wheel to make it roll smoothly. You can Start about one crank turn away from the obstacle...on your good pedal. Roll the first half crank turn slowly to approach the step or wall. Start about one crank turn away from the obstacle...on your good pedal. 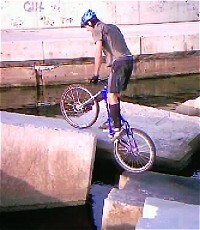 1° On the second half crank turn, push on the goofy pedal (left) to lift the front wheel up to the edge of the obstacle. You must aim right at the edge, not behind. 2° As the front wheel takes off, keep the knees slightly flexed, ready for an impulse as soon as the front wheel passes or touches the top of the kerb. 3° Finish the crank turn on your good pedal and, from the highest position (on the pedals), throw your shoulders over the bars with an impulse upwards. 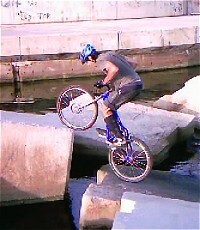 The rear wheel takes off while the front wheel rolls on the obstacle. See this move in a video. Also check out that move over a big truck tyre. This is technically the smoothest way to climb. 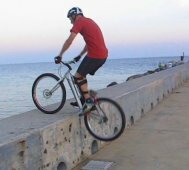 You should really force yourself to lift the front wheel only when pushing on the bad-foot pedal, so that when the front wheel reaches the edge of the obstacle, you end up on your good foot ready to take your impulse, and able to throw your shoulders over the bars to lift the rear wheel. 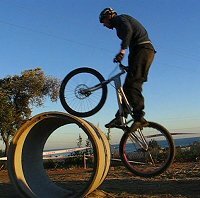 When the move is well done, you can even roll directly on the front wheel, passing over the edge of the obstacle without touching it. At the beginning, you'll tend to smash your crank into the edge you're trying to climb, so get yourself a decent rock ring. A bad habit is to use the front brake once the front wheel has landed, to give some extra lift to the rear wheel. You should really try to learn without braking on the front (else, how do you get the quiet and smooth rolling part?). 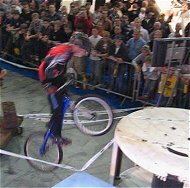 When the obstacle is too high for just touching the edge of the wall with the front wheel, then the roll-over technique can be pushed to its limit by giving a strong impulse in the good pedal just before take off, and throwing your shoulder and body weight over the bars even before the front wheel reaches the obstacle. This also works for very steep but rounded obstacles (large boulders, cable reels, concrete pipes etc.) where you know you'll be able to secure some grip if you roll up high enough. 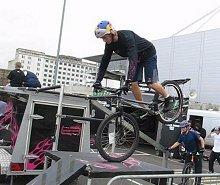 You end up in the air, with the front wheel above the edge of the obstacle, and using your body inertia to pull the bike upwards with you, over the edge. 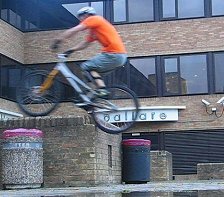 This could look like a bunny hop, but there is a huge difference: your body weight is really in front of the bike over the bars, and you land on the front wheel instead of landing on the rear. If you overdo it, you just end up rolling in balance on the front wheel. In some rare cases, you'll be able to use a little lump in the run up space to pull a bunny hop and carry on as a roll-over (because landing on the rear would make you fall back. 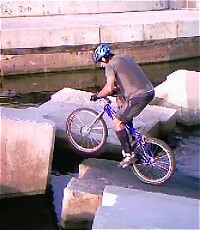 The next technique, starting exactly the same, is to bang the front wheel on the edge of the wall or just below, in an ascending move. You'll need a lot of practice before you can even think about it. In the mean time, you can try to climb onto small kerbs sideways. Quite safe, and virtually no space needed. 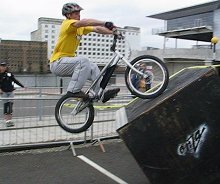 Rolling over is an amazingly smooth technique when fully exploited by top riders, with loads of variations and finish styles. It really looks as if there is direct a slope. 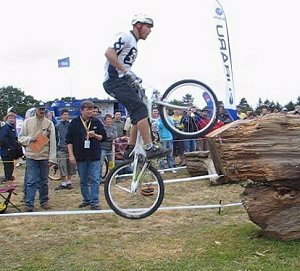 Depending on the obstacle, the real trick is to throw the body far enough to ensure plenty of momentum and a good grip. Thomas Oehler finishes on the front. Rolling over the edge, at speed. Pedal up with extension to roll over.